David is 36 years old. He has been at our Apollo location since January of 2018. In 2017 David was hit by a car twice while walking across the street. He was in the hospital for 10 days and another nursing home for about 2 months. After that he was residing in a personal care home. While he was in the personal care home, he attended an art program and his career took off from there! While he was in the personal care home he was sent to the hospital with respiratory failure. When he was well enough, he decided to make a change and selected Quality Life Services for his care. David chose our Apollo location as his new home and boy, are we lucky! Over the course of time, David has donated his art to many of the staff and residents here in the home. 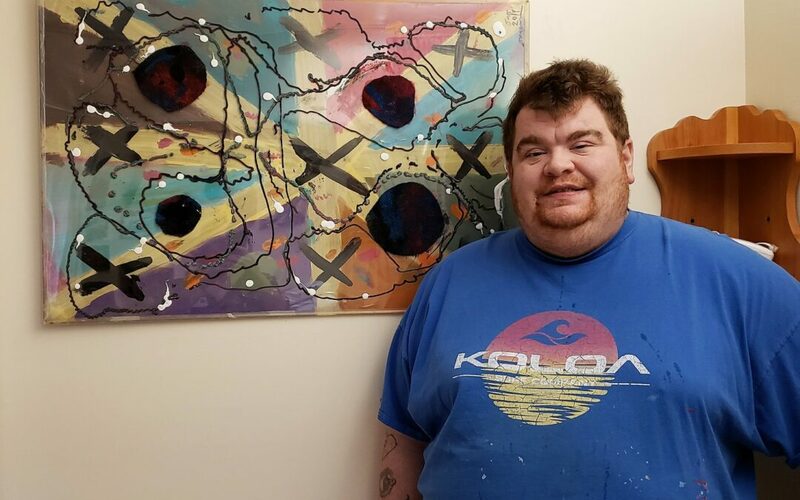 David said that he “almost died twice in two years and he thinks someone is keeping him alive to continue on with his art.” He uses his art as a coping skill to get through his days being in a nursing home as a young man. Right now David has been re-purposing a lot of materials into art. He has used a few materials from our Apollo building that were going to be scrapped. His talent and warmhearted soul is awe-inspiring. We are honored to have his art displayed throughout our Apollo location and at our corporate office.